ICI specializes in automation services for projects ranging from a single loop control to Plant-Wide Systems of 65,000 Points. 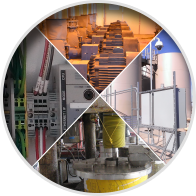 With the expertise to deliver solutions from developing a system architecture to installation supervision, ICI is the go to name for numerous industries around the world. ICI has moved! We are now located at 2836 Corporate Parkway, Algonquin, IL 60102 – Pictures of the new office to be posted soon! ICI staff members are involved in various professional organizations. This group of select firms have developed standard business “Best Practices” that its members follow to assure that they provide clients with consistent quality engineering services. © 2019 Innovative Control, Inc. All Rights Reserved. PLEASE NOTE: This website and all of its contents, materials and related information is the property of Innovative Control, Inc. and/or used by Innovative Control, Inc. by permission. All such contents, materials and information are protected by applicable copyright laws and trademark laws, and all rights are reserved to Innovative Control, Inc. All trademarks and trade names used on this website are the property of Innovative Control, Inc. or belong to their respective owners. Neither this website nor any of the contents, materials or information included herein or attached hereto may be reproduced, modified, or redistributed to any party absent the express written consent of Innovative Control, Inc.